Remember the half-brilliant/half-idiotic Fantastic Four storyline "The Masters of Doom"? What they did to Doom, and how he struck back? I just realized that it would have been a great Doctor Who plot (not to mention an innovative way to introduce a new regeneration). 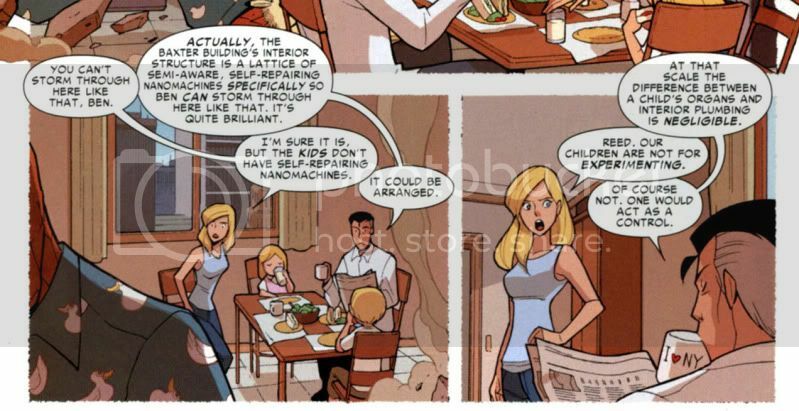 On the other hand, the idea of REED RICHARDS running a private school for dangerously hyperintelligent kids continues to be terrifying and hilarious. It's like the Charles Xavier School of Telepath Ethics, the Anthony Stark Open Innovation Institute, or Bruce Wayne's Home and Counseling Center for Children Victims of Violence. I don't think I'll ever going to get over the fact that it's canon that Reed's parenting skills worry Galactus. FF #21, pg 13, no spoilers. I can see why pretty much all the major empires in the galaxy consider Earth to be Reed's planet (Reed and Galactus basically have each other on speed dial, not to mention the Negative Zone, his alternates' habits of taking over everything, his Celestials-killing son and post-hypergenius daughter, Johnny Storm-who-once-ruled-the-Negative-Zone-for-a-while, Sue's habit of collecting kingdoms, and so on and so forth), but that could make for some funny moments when Reed Richards has to explain to the United Nations that, due to some cultural differences and most civilizations' assumptions about people with ultimate nullifers and pocket universes in their home offices, the galaxy is under the impression that he owns Earth (not that they think he's doing a very good job of keeping it organized, what with hyperpowered megalomaniacs, the Phoenix, the way the Infinity Gauntlet keeps being unlost, and so on, but what can you expect of scientists). I just want be there when Doom hears that, as far as most of the universe is concerned, he's "that guy who keeps pestering Reed Richards, I think?" 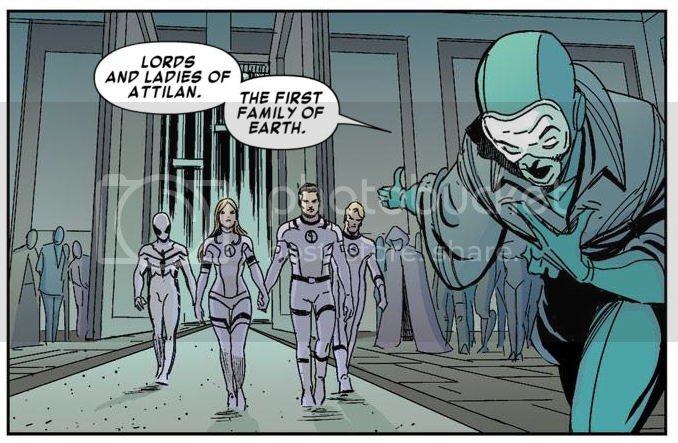 I'm kind of disappointed with Hickman's FF #8. I mean, it's not bad, but you'd think that a Doom-led collection of hypersmart villains would be more... creative in their approach (although Doom's rather amusing physicality was probably deliberate). That said, and I have to ask you to excuse my descent into shallowness, Sue Storm getting pissed off hits all kind of hotness spots. I wonder if that might explain part of Reed's general missing-the-point-ness – his hindbrain keeps getting rewarded every time he messes up. Note that when your daughter has a Richards-level intellect and your son has potentially godlike reality-altering powers, hands-off parenting is arguably the most dangerous item in this list. From the backup story of World War Hulks: Wolverine vs Captain America #2.